In the Bardi Chapel, Giotto painted scenes from the life of St Francis for which the cycle at Assisi served as a model. The limited space in the chapel made it necessary to restrict the number of episodes represented. 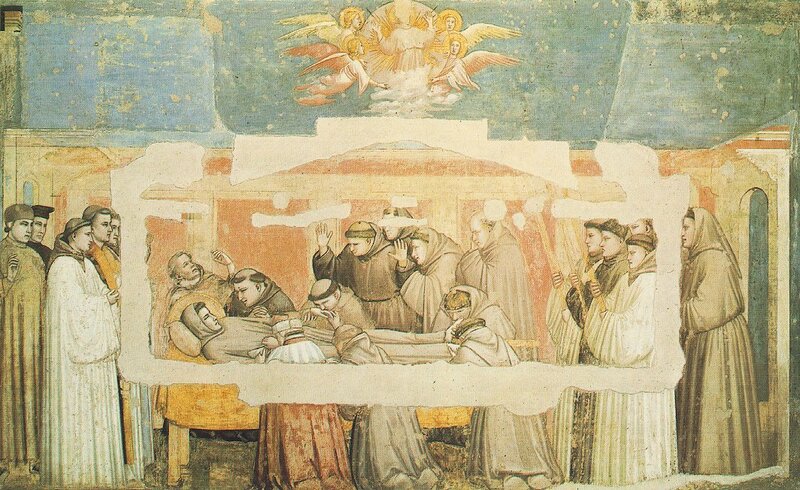 There is an admirable balance maintained between the studied precision of the composition and the eloquent expression of grief in the Death and Ascension of St Francis, where a small group of friars is gathered round the pale figure of the dead saint, expressing their profound sorrow with great dignity. The Bardi Chapel was completely whitewashed in the eighteenth century, and tombs were built against its walls. The frescoes were uncovered in 1852, the missing parts filled in, and the whole surface repainted. When the repaint was removed in 1958-59, the original frescoes reappeared in fair condition, save for the unsightly gaps.